X-Files 2 Movie Plot Revealed! It’s been a big week for X-Files news. 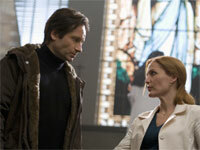 First we finally got the movie’s official tite, X-Files: I Want To Believe. Now we have the plot of the film. The somewhat ironic thing here is that Chris Carter and the folks at Fox have gone to almost draconian means to keep the plot of this underwraps, and now it’s all been for naught because it’s slipped out via the description of the movie’s novelization. That’s gotta hurt.